The white towers of Gondor are home to some of the best fighters in all of Middle-earth. The Swan Knights of Dol Amroth are Gondor's greatest warriors. 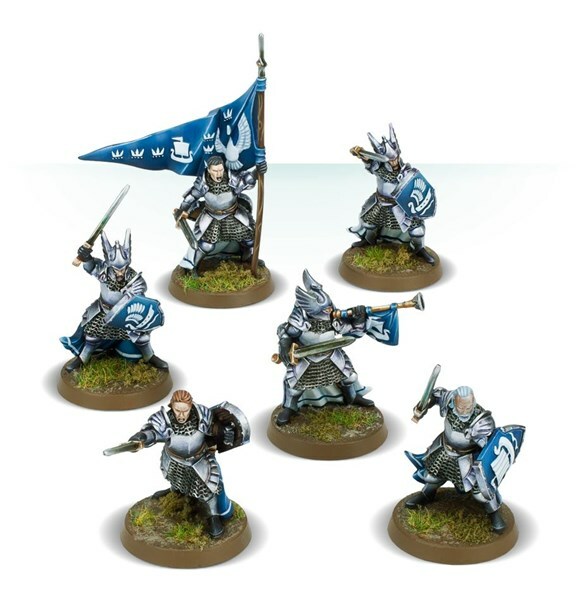 For those playing the Middle-earth Strategy Battle Game, you can add these paragons of virtue and fighting prowess to your army by pre-ordering them from Forge World now. The Swan Knights of Dol Amroth are the most elite warriors Gondor has available. Brave and noble, they are a memory of days long since passed. The knights of Dol Amroth plunge into the ranks of Sauron’s forces to pierce the hearts of his armies and rekindle the hope of the Free Peoples of Middle-earth. This multipart resin kit contains the components necessary to assemble 6 Knights of Dol Amroth. Each of these is armed with a sword, with different shield options available to 3 of the models. A variety of heads are supplied - 6 helmeted and 4 bare - along with options for 1 model to hold aloft a banner and another a horn.